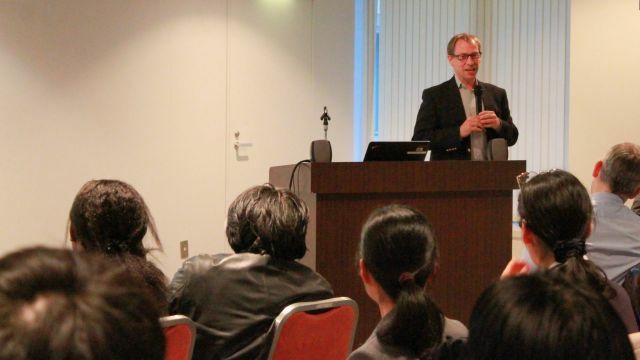 On 14 December 2015, UNU-IAS organized the seminar Sustainability Science in a Global Landscape in collaboration with Elsevier. The event introduced the Elsevier report of the same name, and discussed the future direction of sustainability science research and capacity development. The UN Sustainable Development Summit held in September 2015 adopted the 2030 Agenda for Sustainable Development with its 17 Sustainable Development Goals (SDGs) and 169 targets. Echoing this new global initiative, Elsevier developed a report on sustainability science in a global landscape in collaboration with The Lancet and SciDev.Net to provide valuable insights into the global research landscape surrounding the SDGs. The report contributes to the understanding of sustainability science as a research field and the dialogue between science and society in sustainable development. The seminar began with opening remarks by Dr. Osamu Saito (Academic Programme Officer, UNU-IAS), which were followed by a screening of video interviews featuring three Japanese experts sharing their views on the role of sustainability science, the key findings of the report, and the roles of academic institutions and researchers. Next, Dr. Anders Karlsson (Vice President, Global Academic Relations APAC, Elsevier) explained the background, methods and results of the report, including trends in research output, research collaboration and the application of an interdisciplinary approach. Dr. Eric Zusman (Principal Policy Researcher, Institute for Global Environment Strategies) added perspectives from different angles by taking an integrated approach to the SDGs and examining the role of sustainability science. Examples of an integrated approach intervention were also discussed. After these presentations, Prof. Yuya Kajikawa (Associate Professor, Tokyo Institute of Technology) provided an overview of academic landscape changes in sustainability science from the early 2000s to 2013, and suggested future directions for sustainability research, such as the integration of the natural and social sciences. Over 60 participants including students and researchers attended this seminar, participating actively in the discussion session. Presentations from this event can be downloaded here. Anders Karlsson (Elsevier) "Sustainability Science in a Global Landscape"
Eric Zusman (IGES) "Taking an Integrated Approach to the SDGs: A Role for Sustainability Science"